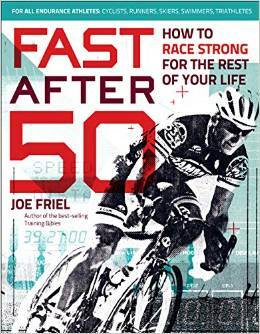 Fast After 50: How to Race Strong for the Rest of Your Life by Joe Friel, is written specifically for avid cyclists who wish to maintain peak performance during and after their 50’s. Joe Friel is the author of The Triathlete’s Training Bible and The Cyclist’s Training Diary, plus several other books on triathlon, cycling and running. Cycling is an amazing sport and exercise that allows people to continue to push themselves to their limits for decades. This book teaches that getting a little older does not mean that you have to slow down. Joe Friel shows you how to modify your training and workouts to avoid the dreaded overtraining and also how to lose fat and gain more muscle. The book is written in such a way that it helps you to create your own progressive plan for training, rest and recovery and also aims to prepare its readers for competition. There are workouts and fitness tests that if followed provide an objective way to improve speed and stamina. This is a groundbreaking book that provides a scientific approach to training that not helps people over 50 to compete but also stay healthy and fit for many more decades to come. Dr. Larry Creswell, heart surgeon, educator, triathlete. Dr. Tim Noakes, professor of exercise and sports science at the University of Cape Town. Hello Sir, Sir when i i train bicep, the next day i feel really great pain between my arm and bicep. Possible causes of this and solution will be appreciated. Thanks in advance. Hard to say. Could be that you are lifting too much weight too soon and the muscle is tearing. It could be caused by over training the muscles, and developing tendonitis. Advice on LiveStrong says to rest the arm for 3 weeks, then ease back in with warm ups, stretching and go easy for a while. If it continues, get help from a sports physio.